Italian studio Matteo Thun & Partners present a series of gently rounded bathroom fittings for German design brand Dornbracht at ISH 2011 in Frankfurt, which opens today. 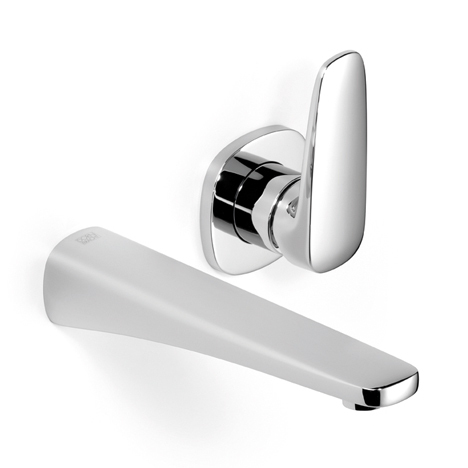 Called Gentle, the series includes fittings for a basin, bidet, shower and bath. At the ISH trade fair in Frankfurt (15 – 19 March 2011), fittings manufacturer Dornbracht is presenting Gentle, a new product that fits seamlessly and elegantly into an everyday bathroom context. Something special in the day-to-day routine – Gentle represents quality of function and serenity of form. The Gentle truely expresses everyday elegance. summer 2011. The product was designed by Matteo Thun & Partners.